We promote local food production and teach children how to grow, prepare and eat healthful food. As part of the national Slow Food organization, we strive to make local/seasonal food available for all, and celebrate food as a cornerstone of culture and community. Our chapter hosts local activities and educational events that support this mission. 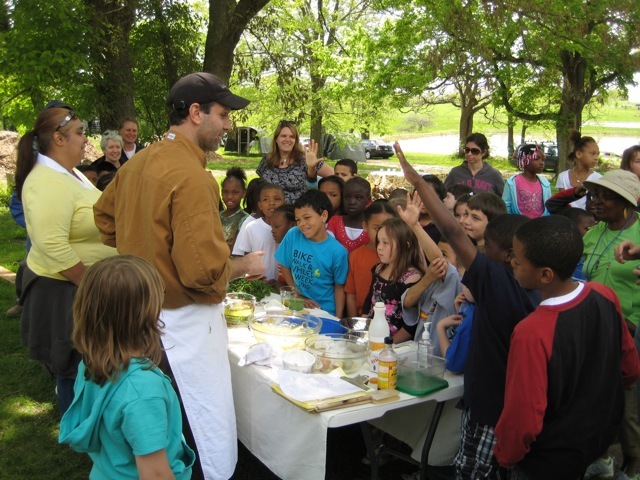 We teach Columbia children how to grow and cook local, seasonal and sustainably raised food. Our Harvest-of-the-Month program introduces 2nd and 3rd graders to area farmers and the foods they produce. With Slow Food-volunteer help, they learn the health benefits of these foods, as well as the pleasure that comes from preparing and sharing them. Over 25% of Boone Countians suffer from obesity and nearly 15% from hypertension—both related to diet/malnutrition. We believe the community will benefit when children and their families learn the impact of good food on their health/happiness. We feel these lessons can be taught early, and that our efforts to do so deserve the community’s support. Volunteer needs: farmers/cooks/parents/gardeners/graphic designer/writer with passion for local food to assist with our school-program/educational activities. In-kind needs: gardening supplies/mobile kitchen.